We started to notice this algae on a sand pit, nothing unusual. I'm just curious what causes this recent growth or what this algae/vegetation may be called. Really any information about it. Increase in nutrient flush into the pond from recent rains? Just a guess. Algae are plants. What causes plants to grow? Your pit has a whole host of algae and different algae will bloom at different times. Sunlight penetration, temperature and nutrients determine which algae will bloom when. Been happening forever. Thanks guys. A few people are worried about it being unsafe, I responded and told them it's a typical growth for the time of year. I was hoping to find a name for it, but I'm sure that's very hard to identify visually. I would not even try to guess what type of algae that might be just by looking at a picture. One thing I would tell you from looking at the photo--whatever kind of algae it is, there ain't enough there to even think twice about. Much of the toxic bluegreen algae "stuff" is hysteria that has been blown out of proportion. If you wish, there is some additional information on that here, Bluegreen Algae. 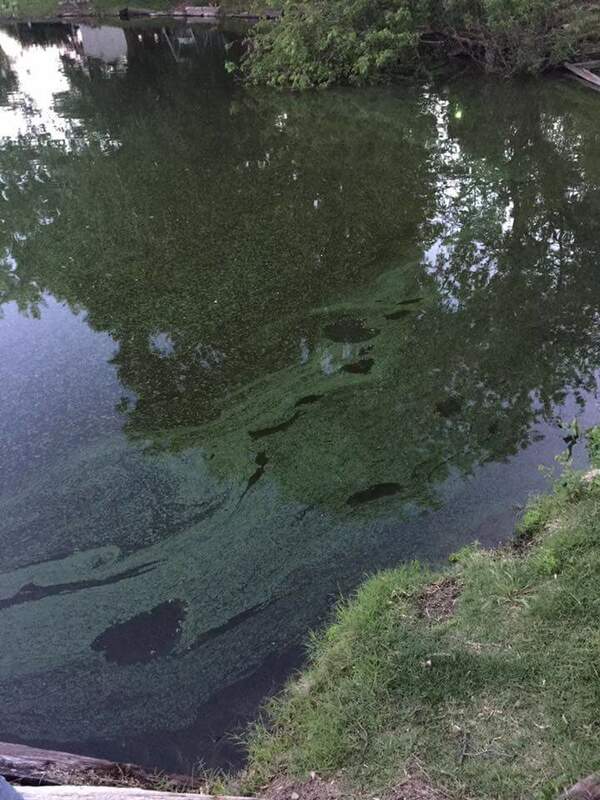 When that is something to be concerned about, typically later in the summer, you will know it--when the water looks like pea green soup, or it looks like someone spilled a can of John Deere-green paint on the surface.